Why are some bear seasons easier? Bear conflicts are common in places such as La PLata County – and they don’t always involve people. 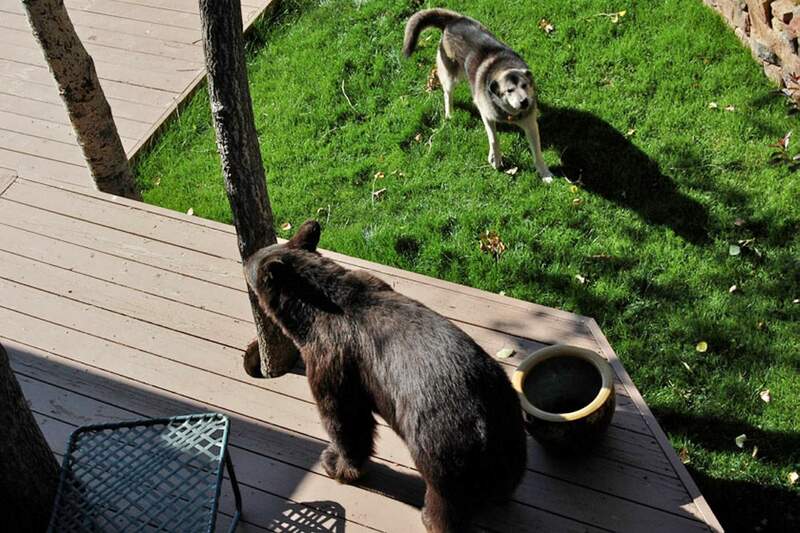 This bear got an earful from a Durango homeowner’s dog in 2012. And they’d be right. It’s been a relatively quiet bear year, especially compared with last year – hopefully, one not to be repeated. However, these bad bear seasons (2003, 2007, 2012) are increasing in frequency, and it wouldn’t be too shocking to have another in the near future. With that in mind, what are some of the factors that make up a bear season and how do each contribute to the level of human and bear conflict? Bear population: Black bears are doing well nearly everywhere, and there is little reason to suspect otherwise here. Many people would stop reading at this point. And they would be in error in thinking that bear numbers are the sole factor in having bears around. Also, last year’s natural-food failure no doubt took a toll on bears. In such years, fewer cubs are produced and there is increased natural and human-caused mortality. Locally, in 2012, 20 bears were relocated, and 82 bears, (the most in a decade), were killed by vehicles and as “nuisances.” Removing bears, especially 30-some animals whose unwanted behavior we enabled, would certainly affect the following season. If one were to look at a map of county subdivisions in 1970 and compare it to present day La Plata County, it would be immediately apparent that bears are encountering large chunks of human development in what used to be simply bear habitat. Not a knock on growth, but how it is. Natural-food conditions: Natural foods that bears rely on have been good this year, and acorns and berries are coming on. Most importantly, unlike last year, there was no late freeze to wipe out their fall foods, which are critical for bears preparing for their foodless, six-month hibernation. Availability of human food: Bear experts agree that the primary cause of – and the single biggest factor in – human-bear conflict is that we make food available to bears. In a 2007 letter to city of Durango officials, Patt Dorsey, southwest regional manager for Colorado Parks and Wildlife, wrote, “Unsecured trash is the principal cause of the increase in wildlife activity in the city.” A study from 2006 showed that bird feeders were the root cause of up to 80 percent of human-bear conflicts in New York. Many factors – another being complacency – play into a bear season and in having bears around. But, being from simple, sensible Midwestern stock, I’ll stick with: If you remove the food, you remove the bear. bp@frontier.net. Bryan Peterson is director of Bear Smart Durango, formed in 2003 to educate residents about coexisting with bears and working toward reducing the amount of human foods available to bears. Visit www.bearsmartdurango.org or follow on Facebook.